We analyze the parts and then select the tool we think will provide the best solution, and then we run tests. We then return the part with our best recommendations regarding the selection of the tool, the operating parameters, and surface finishing measurements, if required. 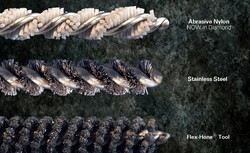 Brush Research Manufacturing is offering its considerable resources - including a knowledgeable engineering department and a surface-finishing laboratory - to assist manufacturers in Germany and the United Kingdom in their selection of flexible honing tools and miniature brushes used for small part deburring, edge blending or other surface finishing. "With the broad selection of miniature brushes and flexible hones available, customers have a lot of questions about the operating parameters and options, particularly the first time," says Mike Miller of Brush Research Manufacturing. Today, there is a broad selection of miniature brush choices that vary not just by size, but also in filament type. Filament choice depends on the base material being finished, the severity of the burr and the final finish required. Carbon steel and stainless steel filament brushes are effective in cast iron and steel to remove chips and breakout burrs. Abrasive filled nylon is effective for improving surface finish and reducing burrs in softer materials and is a very good choice for deburring threads in both steel and aluminum. Brass filaments are excellent for soft materials. Nylon and natural filaments are mainly used for cleaning. Both can be used as a carrier for a diamond paste or cutting compound for polishing applications. A miniature brush is now available with a diamond abrasive-filled nylon filament. This high tech material is perfect for finishing ceramic, glass, aerospace alloys and tool steel and its unique flexibility provides longer tool life. The advantage of diamond abrasive nylon is that it will cut harder materials, deburr faster and last longer. The application will certainly affect the choice of tool and includes variables such as contours required, the type of material, and the amount of material to be removed. Other factors that apply to brushes used in automated applications include RPM of the machine tool, feed rates, and optimum wear-life of the brushes. "We encourage manufacturers from Germany and the UK to send the parts in question to us--the parts they would like to deburr or finish with a miniature brush or honing tool," explains Miller. "We analyze the parts and then select the tool we think will provide the best solution, and then we run tests. We then return the part with our best recommendations regarding the selection of the tool, the operating parameters, and surface finishing measurements, if required." Established in 1958, Brush Research Manufacturing designs and produces miniature brushes and flexible honing tools in an assortment of designs, sizes and materials.